Chitosan was used as an alternative to promote the growth of weaned piglets. And low-molecular-weight chitosan (LC) is one of chitosan derivatives and maintain beneficial biological properties of chitoson. The present experiment was carried out to examine the effects of LC on the growth performance, intestinal morphology, barrier function, cytokine expression, and antioxidant system of weaned piglets. A total of 40 piglets weaned at 21 d of age, with average body weight 6.37 ± 0.08 kg, were randomly assigned (5 pens/diet; 4 pigs/pen) to 2 treatments (a basal diet and the basal diet supplemented with 50 mg/kg LC) and were fed for 28 d. Compared with the control group, average daily feed intake (ADFI), and the expression of intestinal barrier protein ZO-1 was increased (P < 0.05) when the piglets fed the diet supplemented with LC. No significant differences were found in average daily gain (ADG, P > 0.05), gain-to-feed ratio (G:F, P > 0.05), the incidence of diarrhea (P > 0.05), or the antioxidant capacity (P > 0.05) between two groups. 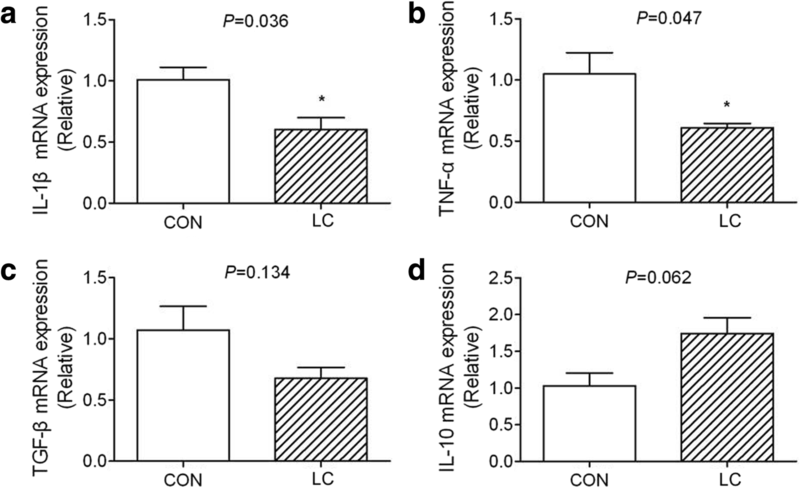 The expression of IL-1β and TNF-α in jejunal mucosa were significantly decreased (P < 0.05) in piglets fed the LC-supplemented diet in comparison to the control. The results of this study indicate that dietary supplementation with LC at 50 mg/kg was effective for enhancing the growth performance in weaned piglets, improving intestinal barrier function and alleviating intestinal inflammation. Weaning is an important stage of gut development and may cause low feed intake, intestinal dysfunction and growth retardation in piglets [1, 2]. Antibiotics have long been used to solve problems in the weaning period and to promote the growth and health of piglets . As the use of antibiotics can lead to bacterial resistance and potential antibiotic residues in animal products, thus many alternatives to antibiotics have been suggested and tested. Chitosan with the molecular weight of 1000 kDa, is the second most abundant carbohydrate polymer in nature [4, 5]. It has been reported that chitosan has been widely used as a potential alternative to in-feed antibiotics in piglets and broiler chickens due to many beneficial biological properties of it, such as promoting the growth performance [6, 7], anti-oxidative  and immunity modulation . However, chitosan is restricted to be used in food and biomedical applications because of its difficult solubility and instability . Low-molecular-weight chitosan (LC, < 150 kDa) and chito-oligosaccharide (COS, < 5 kDa) are obtained from chitosan by physical, chemical or enzymatic methods, and have much higher solubility and stability than chitosan. Chito-oligosaccharide (COS) with the properties of antimicrobial, anti-inflammatory, anti-oxidative and immunity modulate [11, 12], is widely used as a dietary additive in livestock. But it is still unclear whether dietary supplementation with LC can affect the piglets. The objective of the present experiment, therefore, was to clarify the effects of low-molecular-weight chitosan on the growth performance, incidence of diarrhea, intestinal morphology, barrier function, immune response, and antioxidant system in weaned piglets. The piglets examined in the present study were approved by the Animal Care and Use Committee of the Institute of Animal Science, Guangdong Academy of Agricultural Sciences, with the approval number of GAASISA-2016-017. A total of 40 Duroc × Landrace × Yorkshire piglets weaned at 21 d of age were blocked by BW (average 6.37 ± 0.08 kg), and randomly assigned to 2 treatments with 4 pigs per pen and 5 replicate pens per treatment. The piglets were purchased from WanHe Nongmu Co., Ltd., Guangdong, China. These were (1) a control group (CON) fed the basal diet, and (2) the basal diet supplemented with 50 mg/kg low-molecular-weight chitosan (LC); both were fed for 28 d. The LC (molecular weight 20 to 30 kDa), which was obtained from chitosan by radiation pyrolysis technology, was offered by Jiaxing Korui Biotech Co., Ltd., Zhejiang, China. The composition and content of the treatment diets were shown in Table 1. Piglets were housed in a temperature-controlled nursery and had ad libitum access to feed and water. The body weight of piglets and amount of the feed was measured to calculate the average daily gain (ADG), average daily feed intake (ADFI), and gain-to-feed ratio (G:F). The number of pigs with diarrhea was recorded every day. Diarrhea index (%) was calculated as 100 × number of piglets that had diarrhea/total number of piglets. The BW of each piglet was recorded at the end of the experiment. After 12 h fasting, five pigs (1 per pen) were randomly selected from each treatment and anaesthetised with pentobarbital sodium (50 mg/kg, i.v.). After sedation, serum was obtained by centrifuging at 2000×g for 10 min and stored at − 20 °C for subsequent measurements of activities of catalase (CAT), glutathione peroxidase (GSH-Px), and total superoxide dismutase (T-SOD), and contents of malondialdehyde (MDA) and total antioxidant capacity (T-AOC), using commercial kits (Nanjing Jiancheng Bioengineering Institute, Nanjing, China). The gastrointestinal tract was immediately removed after slaughter, washed with cold PBS. And then 2–3 cm segments of duodenum, jejunum and ileum were removed and fixed in 4% formaldehyde for histometric analysis. Mucosa was scraped from a 10–15 cm segment of jejunum and stored at − 80 °C for gene expression analyses. The fixed intestinal segments were dehydrated and embedded using low-melt paraffin wax by routine methods. Three cross-sections (5 μm) of each segment were dewaxed then stained with hematoxylin and eosin. Villus height and crypt depth of each intestinal segment were measured at 10 × magnification using an image processing and analysis system. At least 10 well-oriented intact villi and their associated crypts were examined in each intestinal segment of each piglet. The mean villus height and crypt depth of each section were calculated per piglet and used for further analysis. Total RNA from jejuna mucosa was extracted according to the manufacturer’s instructions of TRIzol reagent (Invitrogen, Carlsbad, CA). The concentration of RNA was measured by NanoDrop ND-1000 (Thermo Fisher Scientific). And the integrity of RNA was checked by electrophoresis on 1% agarose gel. After removed genomic DNA with gDNA Eraser (TaKaRa, Dalian, reverse transcription was carried out using PrimeScript™RT reagent kit (TaKaRa, Dalian, China) followed the manufacturer’s instructions. The expression levels of intestinal tight junction and cytokines were analyzed using SYBR® Premix Ex Taq™ II kit (Takara, Dalian, China) and iQ™5 Real Time PCR Detection System (Bio-Rad, Hercules, CA, USA). The sequences of the primers were listed in Table 2. The 2-ΔΔCt method was used to estimate the abundance of mRNA. All data were subjected to a t-tests using SAS (Version 8.1; SAS Inst. Inc., Cary, NC). Data are presented as means and SEM. P-values < 0.05 were used to indicate statistical significance. As shown in Table 3, ADG and ADFI was increased by 22.28% (P = 0.084) and 8.95% (P < 0.05) in the piglets fed with dietary supplementation with low-molecular-weight chitosan (LC). No significant changes were found in G:F and rate diarrhea rate between control group and LC group. No significant differences in villus height, crypt depth, or villus height:crypt depth in duodenum, jejunum and ileum were observed between CON and LC groups (Table 4, Fig. 1). Dietary supplementation with low-molecular-weight chitosan (LC) significantly decreased (P < 0.05) the expression of IL-1β and TNF-α in the jejunal mucosa of piglets in comparison to the CON group (Fig. 2a-b). 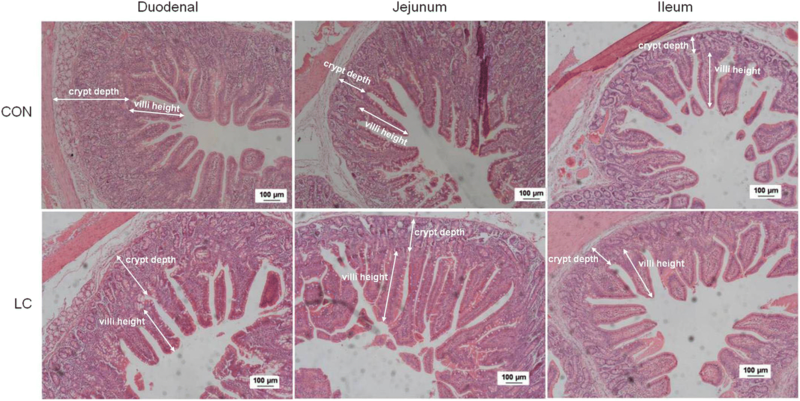 There were no significant differences in the jejunal mucosal expression of TGF-β and IL-10 (Fig. 2c-d). The effect of LC on the activity of serum antioxidant enzymes and indices in weaned piglets are shown in Table 5. While there were no significant differences, activities of antioxidant enzymes, T-AOC, CAT, GSH-Px and T-SOD were slightly higher in the piglets fed LC-supplemented diets, and the concentration of MDA in serum was reduced. Compared with the piglets in control group, the relative expression of jejuna mucosa ZO-1 transcripts was dramatically increased (P = 0.025) in piglets from LC group, while no significant change was found in the expression of Occludin-1 (Fig. 3). Chitosan, one of the most abundant polymers in nature, is an alkaline polysaccharide with positive charges . Because of its characteristics of nontoxic , and the biological activities, such as antimicrobial activity and anti-inflammatory [15, 16], chitosan is widely used as a dietary supplement in livestock industry to promote the growth [13, 17]. However, the influences of low-molecular-weight chitosan (LC) on the growth of livestock remain unknown. In the present study, the effect of dietary supplementation with 50 mg/kg LC (20–30 kDa) on growth performance, incidence of diarrhea, intestinal morphology, intestinal barrier, cytokines expression and anti-oxidation indices were examined in weaned piglets. The results demonstrated that, after 4 wk. of post-weaning feeding, there were no significant differences in ADG and G:F between piglets fed the LC-containing and control diets. When compared with the piglets fed the CON diet, ADFI was significantly increased by about 9% and ADG increased 22% in the piglets fed LC. While the latter was not significant, it was of greater magnitude than the change in ADFI, suggesting that the effects of LC on nutrient metabolism might mediate part of the growth response. It has been demonstrated that low molecular weight chitosans prevented the increases in bodyweight by decreasing the absorption of dietary lipids  and intestinal disaccharidase activities . Many studies showed positive effects of another small molecular weight COS on the growth performance of weaned pigs; other studies found that there were no significant differences between piglets fed COS-supplemented and CON diets [20, 21]. Walsh et al. demonstrated that 5 to 10 kDa COS possessed antibacterial activity and the 10 to 50 kDa preparation was optimum for enhancing intestinal structure. It can be speculated that the different effects of the LC on growth performance of weaned piglets may result from the molecular weight, dosage, solubility or the duration of LC supplementation. Diarrhea in the post-weaning period is always due to intestinal dysfunction. The decrease of villus height and the increase of crypt depth associated with dysfunction have been found in previous studies [23–25]. Liu et al. observed that 160 mg/kg supplemental COS reduced the incidence of diarrhea and increased the villus:crypt ratio in weaned piglets challenged with Escherichia coli. Supplementation with 200, 400, or 600 mg/kg COS in diets of weaned piglets not influencing the villus:crypt ratio in duodenum, jejunum, or ileum . In the results of the present experiment, basic dietary-supplemented with LC at 50 mg/kg did not influence incidence of diarrhea, villus height, crypt depth and villus:crypt ratio in the duodenum, jejunum and ileum. Supplementation with LC at 50 mg/kg tended to increase the villus:crypt ratio in duodenum and jejunum of the piglets. Tight junctions are the important determinants of epithelial barrier functions . When the piglets feed with 30 mg/kg COS, the expression of epithelial tight junction, such as occluding-1 and ZO-1 was decreased . The present study found that the jejuna mucosa expression of ZO-1 was significantly enhanced by 50 mg/kg dietary LC (20–30 kDa), thought it did not affect the incidence of diarrhea in weaned piglets. Further researches were needed to be carried out to explore the effects of low dosage of COS on intestinal barrier function. The balance between pro-inflammatory and anti-inflammatory cytokines is of great importance for the health of weaned piglets . It has been reported that the intestinal expression of pro-inflammatory cytokine genes, such as IL-1β, IL-6, and TNF-α, is up-regulated in weaned piglets  and the present study found that dietary supplementation with 50 mg/kg LC (20–30 kDa) significantly reduced the jejunal mucosal expression of pro-inflammatory cytokines IL-1β and TNF-α while not influencing that of anti-inflammatory cytokines IL-10 and TGF-β. The data suggest that dietary supplementation with 50 mg/kg LC modulated immune responsivity by inhibiting the expression of pro-inflammatory cytokines in weaned piglets. Oxidative stress accompanies weaning and plays a very important role in intestinal health . The present study found that dietary supplementation with 50 mg/kg LC tended to increase the concentration of the total anti-oxidant capacity and decrease the concentration of MDA in serum, while all the indices showed no significant difference. Previous study reported that dietary supplementation with 30 mg/kg COS had dramatically inhibited T-AOC and T-SOD . In contrast, no significant differences in the antioxidant enzymes and MDA were observed here in piglets supplemented with 50 mg/kg LC. It is widely known that diarrhea usually activates the antioxidant system , so the very slight changes in activities of antioxidant enzyme and the concentration of MDA were consistent with the incidence of diarrhea compared the control and LC-groups. These observations suggested that 50 mg/kg low-molecular-weight chitosan (LC) supplements enhanced the growth of weaned piglets, improved intestinal barrier and inhibited intestinal inflammation. The findings will contribute to the guidance on LC supplements. Shenglan Hu and Yu Wang contributed equally to this work. We would like to thank W. B. Currie, Emeritus Professor, Cornell University, Ithaca, NY for suggestions on the manuscript. SH and YW helped in experiment studies, interpretation of data and preparation of the manuscript. XW, LW and ZJ helped in statistical analysis and manuscript revision. CZ designed the experiment and overall coordinated the project. All authors read and approved the final manuscript. The design of this work, samples collection and analysis were supported by National Natural Science Foundation of China (No. 31601955), the Start-up Fund of the Natural Science Foundation of Guangdong Province (No. 2016A030310322), National Science and Technology Support Program (2012BAD39B01–5) and China Agriculture Research System (CARS-35). The interpretation of data, the modification of manuscript was get the financial support by Science and Technology Planning Project of Guangzhou (201607020035), Science and Technology Program of Guangdong Province (2016A020210041) and Tianjin Science Technology Program (15ZXZYNC00100, ITTPRS2017006). The experimental design were approved by Animal Care and Use Committee of the Institute of Animal Science, Guangdong Academy of Agricultural Sciences (Permit Number: GAASISA-2016-017). The collection of specimens in this work was strictly complied the approved guidelines and regulations of Animal Care and Use Committee.